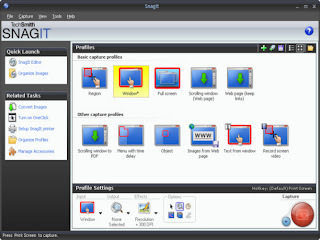 SnagIt: Capture your digital lifestyle. Capture anything you see on the screen. Edit and combine those captures. Share them via your favorite applications. Organize and find them again later. The more you use SnagIt, the more ways you'll find to use it. Want to get a laugh? Add a speech balloon to that photo of your cat and fire it off in an instant message. Need to make an impression at work. Capture that sales chart and point out important details with a sleek-looking arrow. SnagIt can turn a simple screenshot into a powerful information graphic. SnagIt is versatile, yet surprisingly simple.